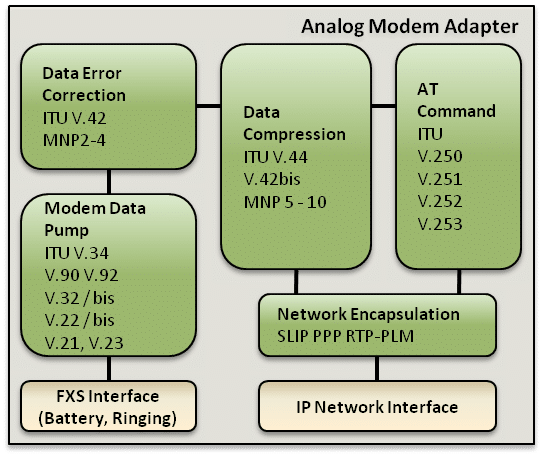 An Analog Modem Adapter (AMA) replaces expensive (and rapidly vanishing) PSTN connections to enable analog modems to transmit data over IP networks. The AMA connects legacy POS, telemetry devices/modems, fax and other analog devices to IP networks including mobile, radio, and satellite (Iridium, etc) networks. An AMA, similar to an Analog Telephone Adapter (ATA), provides a modular phone jack (FXS port) and an Ethernet port. An analog device can be connected to the modular jack to transmit its data over IP networks eliminating the need for telephone landline connections. An AMA supports telephony features such as dial tone, device power, ringing and standard telephone signaling to communicate with the local modem. Initially the ATA was developed to connect analog telephones to digital networks, but AMAs have since evolved to support POS, telemetry, fax and many other dial-up applications. Depending on the transport mechanism, the AMA can be used to communicate over an IP network with a modem server, VoIP server or directly with another AMA endpoint. Large numbers of legacy analog modem devices are still used in retail, industrial and other applications to transmit information to dial-up remote server gateways over traditional telephone land lines. Contact us to discuss your modem application requirements. VOCAL’s AMA software data modulations include V.34, V.90, V.92, V.32/bis, V.22/bis, V.21 and V.23. The software is part of a fully integrated and highly configurable VoIP software solution with a Network Stack, SIP Stack, secure communications, full-featured Telephony software with a comprehensive data modem software library. VOCAL’s AMA software is modular and optimized for DSPs and conventional processors from TI, ADI and other leading vendors. Our AMA software is available for licensing as a library or a complete design with custom solutions available.